15337.8 Zadock 6 BIGELOW, son of Noah 5( Cornelius 4, Samuel 3, Samuel 2, John1) and his third wife Elizabeth (___) BIGELOW, was born 15 July 1807 at Cambridge, Washington county, NY. The family moved circa 1815 to Blenheim, Schoharie county, NY. Zadock was listed as "13 years of age and able to support himself' on his father's pension application in 1815. On 14 February 1830 Zadock married Polly Ackerly, daughter of William and Hannah (Washburn)(see below) Ackerly She was born 11 October 1810, according to Bible inscriptions. They lived a number of years in Andes township, Delaware county, NY, but circa 1853 migrated westward and settled in Fort LeBoeuf, Erie county, PA. There they were ennumerated in 1860 and 1870. Late in life, either visiting -or having moved to Conneaut, Ashtabula county, OH, they had their photographs taken. They are not located in the 1880 census in Erie county, and their deaths are presumed by then. 15337.81t Alonzo D., b 22 Nov 1831; d 14 Sep 1872 Le Boeuf, Erie, PA; m 14 Feb 1855 Laura Gillette. 5 children. 15337.82 Susan Catherine, b 1 Jan 1834. 15337.83 Hannan Elizabeth, b 13 Feb 1836. 15337.85 Phebe, b ca 1851. John 1) and Susan (EARL) BIGELOW; m 1866 Eliza Ann Fry. correspondence with Zora Waschbusch of Estes Park, CO, and Bill Bigelow, Seattle, WA. Over the years Forge, has devoted several articles to Revolutionary War soldier Noah 5( Cornelius 4, Samuel 3, Samuel 2, John1) Bigelow and his sons. Noah has been a major genealogical problem because of his three marriages, his many children, and lack of early records in certain towns in MA, VT, and NY. From census records and from Noah's application for a veteran's pension, we surmise that he had a large family by his third wife, but until recently (1984) had learned the names of only five. 14 Feb 1830 Zadock married Polly Ackerly, born 11 October 1810. They lived a number of years in Andes township, Delaware county, NY, where their children were born. In the 1850's they migrated westward to LeBoeuf, Erie county, PA, where they were ennumerated in 1880 and 1870. 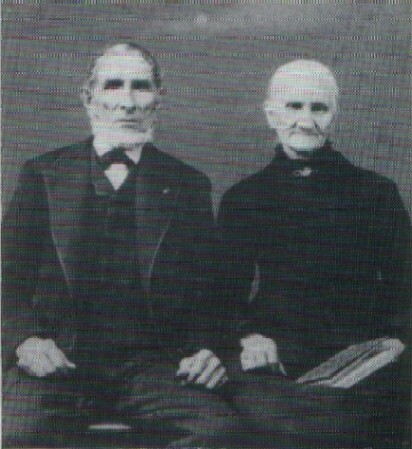 In old age they either lived or visited in Conneaut, Ashtabula, OH, where they had their pictures taken--see above.